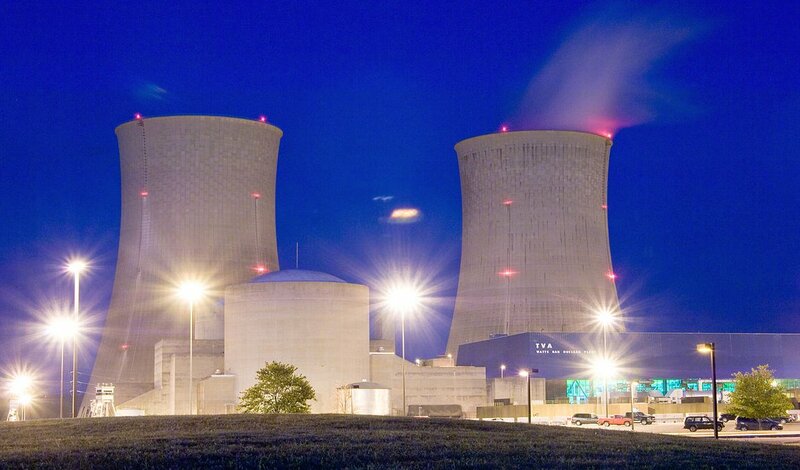 NRC Identifies Nuclear Safety Culture Problems at Watts Bar. What a Surprise. A recent NRC inspection report* was very critical of both the Safety Conscious Work Environment (SCWE) and the larger Nuclear Safety Culture (NSC) at the Tennessee Valley Authority’s (TVA’s) Watts Bar plant. This post presents highlights from the report and provides our perspective on the situation. The inspection was a follow-up to a Chilling Effect Letter (CEL)** the NRC issued to Watts Bar in March, 2016. We reviewed the CEL on March 25, 2016. The chilled work environment and other NSC issues described in the inspection report did not arise out of thin air. TVA has a long history of deficient SC at its plants. Our March 25, 2016 post included a reference to a 2009 NRC Confirmatory Order, still in effect, covering TVA commitments to address past SCWE issues at all three of their nuclear sites. Browns Ferry, another TVA plant, was a regular character in our 2012 series on the NRC’s de facto regulation of NSC. As we noted on July 3, 2012 “Browns Ferry has reported SC issues including production and schedule taking priority over safety (2008), “struggling” with SC issues (2010) and a decline in SC (2011). All of this occurred in spite of multiple licensee interventions and corrective actions.” As part of their penance, Browns Ferry management made a presentation on their SC improvement actions at the 2014 NRC Regulatory Information Conference. See our April 25, 2014 post for details. For a little icing on the nuclear cake, our March 25, 2016 post also summarized the TVA Chief Nuclear Officer’s compensation plan, which doesn’t appear to include any financial incentives for establishing or maintaining a strong NSC. .
Bottom line: This unambiguous and complete inspection report includes multiple, significant deficiencies but it’s not new news. Postscript: On April 13, 2016 we asked “Is Entergy’s Nuclear Safety Culture Hurting the Company or the Industry?” We could ask the same question about TVA. The answer in TVA’s case is “Probably not” primarily because it is a federal corporation and thus is perceived differently from investor-owned nuclear enterprises. For political reasons, public entities, including TVA and the Department of Energy’s nuclear facilities, are deemed too important to fail. As a consequence, the bar for tolerable performance is lower and their shortcomings do not appear to infect the perception of private entities that conduct similar activities. A. Blamey (NRC) to J.W. Shea (TVA), “Watts Bar Nuclear Plant - NRC Problem Identification and Resolution Inspection (Part 1); and Safety Conscious Work Environment Issues of Concern Follow-up; NRC Inspection Report 05000390/2016007 and 05000391/2016007,” (Oct. 26, 2016). ADAMS ML16300A409. “Chilled Work Environment for Raising and Addressing Safety Concerns at the Watts Bar Nuclear Plant,” (March 23, 2016). ADAMS ML16083A479. Wikipedia, “Kingston Fossil Plant coal fly ash slurry spill.” Retrieved Nov. 11, 2016. The Nuclear Regulatory Commission (NRC) recently published NUREG-1650, rev. 6, the seventh national report for the Convention on Nuclear Safety. * The report is prepared for the triennial meeting of the Convention and describes the policies, laws, practices and other activities utilized by the U.S. to meet its international obligations and ensure the safety of its commercial nuclear power plants. Nuclear Safety Culture (NSC) is one of the topics discussed in the report. This post highlights NSC changes (new items and updates) from the sixth report (NUREG-1650, rev. 5) which we reviewed on March 26, 2014. The numbers shown below are section numbers in the current report. This section was updated to include a reference to the 2015 NRC Safety Culture and Climate Survey. The report notes “All U.S. nuclear power plants have committed to conducting a safety culture self-assessment every 2 years and have committed to conducting monitoring panels as described in Nuclear Energy Institute (NEI) 09-07, “Fostering a Healthy Nuclear Safety Culture,” dated March 2014.” (p. 120) We reviewed NEI 09-07 on Jan. 6, 2011. The bulk of the report addressing NSC is in this section and exhibits a significant rewrite from the previous report. Some of the changes reorganized existing material but there are also new items, discussed below, and additional background information. Overall, section 10.4 is more complete and lucid than its predecessor. This contains material that formerly appeared under 10.4 and has been expanded to include two new safety culture traits, “questioning attitude” and “decisionmaking.” The NRC worked with licensees and other stakeholders to develop a common language for discussing and assessing NSC; this effort resulted in NUREG-2165, “Safety Culture Common Language.” We reviewed NUREG-2165 on April 6, 2014. This section covers the NRC’s efforts to maintain and enhance its own SC. The section has been rewritten and strengthened throughout. It discusses the need for continuous improvement and says “Complacency lends itself to a degradation in safety culture when new information and historical lessons are not processed and used to enhance the NRC and its regulatory products.” (p. 130) That’s true; SC that is not actively maintained will invariably decay. INPO also provides content for the report, basically a description of INPO’s activities to ensure plant safety. Their discussion includes a section on SC, which is not materially different from their contribution to the previous version of the report. Like the sixth national report, this seventh report appears to cover every aspect of the NRC’s operations but does not present any new information. In other words, it’s a good reference document. The NSC changes are incremental but move toward increased bureaucratization and intrusive oversight of NSC. The NRC is certainly showing the hilt of the sword of regulation if not the blade. We still believe if it reads like a set of requirements, results in enforceable interventions and quacks like the NRC, it’s de facto regulation. * NRC NUREG-1650 Rev. 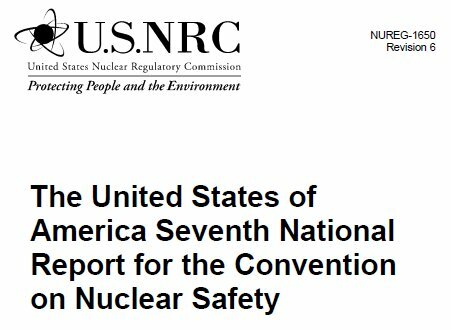 6, “The United States of America Seventh National Report for the Convention on Nuclear Safety” (Oct. 2016). ADAMS ML16293A104. The Convention on Nuclear Safety is a legally binding commitment to maintain a level of safety that meets international benchmarks. ** This detailed guidance is also mentioned in 12.3.6 Support to Event Investigations and For-Cause Inspections and Training (p. 148).